Cement silo of concrete batching plant is a closed storage bin to store materials. It is mainly used to store food, cement, fly ash and other materials. There is a material level system on the cement silo which can show the material level and volume. Cement silo is usually applied to construction, water conservancy, etc. 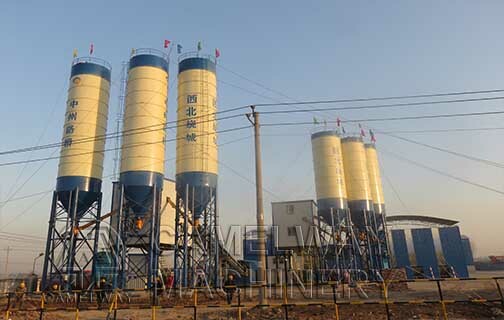 Though the daily maintenance work of cement silo is according to the maintenance method dust collector in the top of cement silo, generally speaking, we can take maintenance work of cement silo as following aspects. At first, cleaning work is an important part in the daily maintenance work. The external cleaning of cement silo is only by water wash, and as for the internal cleaning, it must be treated very seriously. Generally, there are dust collector and broken arch device in the top of cement silo. When cleaning the cement silo, after cleaning it by cleanser, there must have no water in the silo to avoid rusting.